How many times per week should I attend yoga class? Do I need to drink water? If so, how much? I’ve never done yoga before. Is Bikram right for me? When will I begin seeing changes? Can I lose weight practising Bikram Yoga? Do I get any benefits if I fail to perform postures properly? For best results, you are encouraged to attend Bikram Yoga classes for 3 or more times per week. It’s recommended that you drink water both before and after your Bikram Yoga class. Two (2) to three (3) litres each day is optimal. When your body is properly hydrated, light-headedness and dizziness are less likely to occur. Regardless of your skill or fitness level – Bikram Yoga can improve your health and life. Every class is suitable for, and open to beginners. 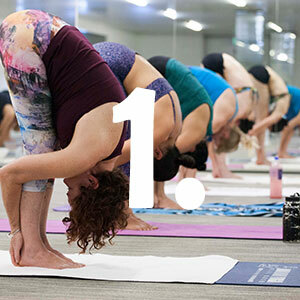 Every class follows the same series and format – regardless of your familiarity or experience with yoga. Getting the postures right isn’t as important as trying to do each the right way. Bikram Yoga Five Dock provides all newcomers a special $35 for 21 days pass. This is the best way to determine if Bikram Yoga is right for you. You might feel very tired after class. This is absolutely normal. And, it’s a good sign that your body is cleansing. Your energy levels should be restored to normal within several classes. On the other hand, you might find yourself feeling extremely energetic and experience difficulty sleeping. Don’t worry, this is a good sign that the yoga is filling you up with energy. Also, you might feel dizzy or nauseous. This is a normally a sign that your body is dehydrated. Replenish your body’s fluids with at least 2 to 3 litres of water per day. You must also replenish your minerals – the major ones being sodium, potassium, magnesium, and calcium. 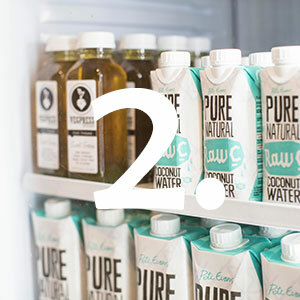 The studio sells coconut water and electrolyte tablets which are fantastic to help your body hydrate. Lastly, you might feel stiff or sore after class. In this case, it’s best for you to come back as soon as possible! Your body is waking up and coming alive. It’s important for you to keep the process going. Not at all. Bikram Yoga Five Dock is a large studio with plenty of space. Class sizes can be between 10 to 40 people. Just arrive at least 15 minutes early to register for your first class. Your progress and changes depend upon the time and effort you put into practise. Nevertheless, most students are shocked by the changes they notice after just a few yoga classes. Whether you’re looking to improve your muscle tone or reduce your weight, Bikram Yoga can help. The Bikram series of 26 postures helps to strengthen and tone your body – whilst boosting your metabolism. For best results, practise at least 3 times per week, consistently. You don’t do yoga, you try yoga. You don’t have to perfect the postures to enjoy the benefits. As long as your body is aligned correctly whilst breathing and putting in your best effort – you’ll enjoy 100% maximum benefits.